The 30-year-old was introduced with United trailing to Cristiano Ronaldo’s stunning volley, his first Champions League goal for the club . But the visitors claimed a surprise win thanks to Juan Mata’s free-kick and an Alex Sandro own goal on Wednesday, with Jose Mourinho’s side turning to Fellaini as the visitors took a more direct approach to spark their comeback. 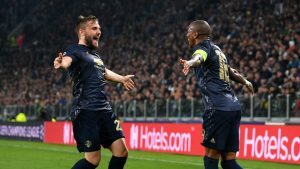 The Belgium international almost got on the end of Ashley Young’s set-piece that led to the winning goal and, even though he did not find the net, Allegri said Fellaini was decisive in the Group H clash.